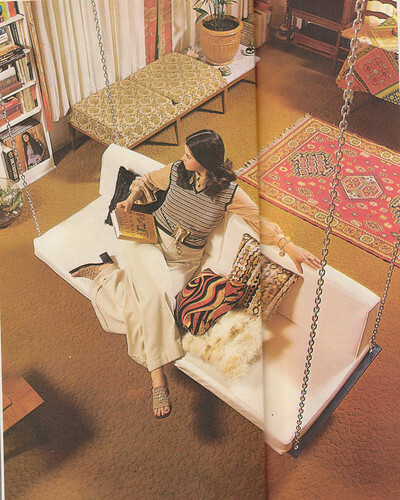 Here's another dozen or so glimpses inside the 1970s home.... a time when a chair swing was perfectly okay sitting right in the middle of your living room. 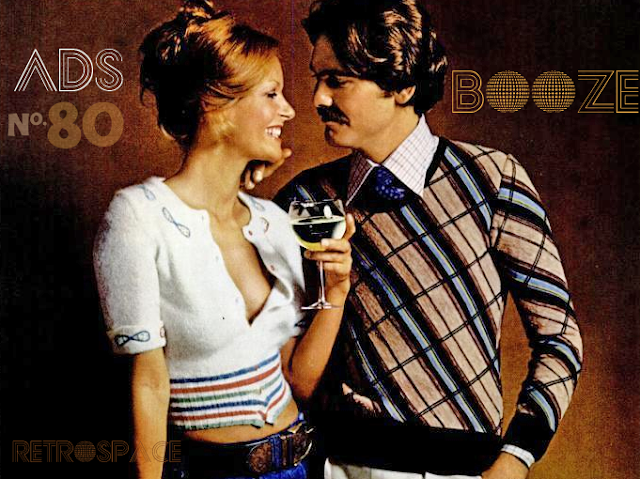 I must confess, I love the 70s style - it was so unique and daring. 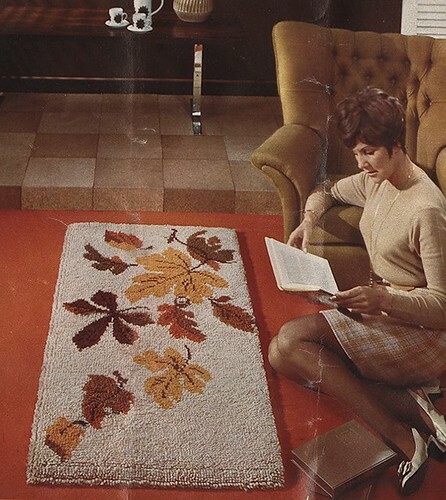 Sure, its colors were either ultra-brown or loud and obnoxious - but that's part of the charm. 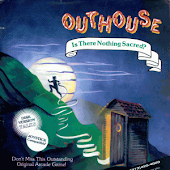 It's easy to dismiss as tacky; but, with an open mind, it was really interesting and fun. 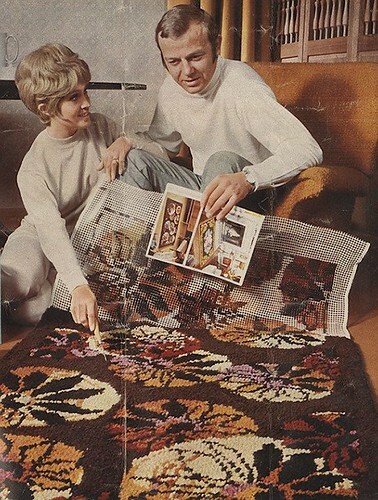 The big colors were avacado and lime green, orange, harvest yellow, and all the earthtones - most notably doo-doo brown. 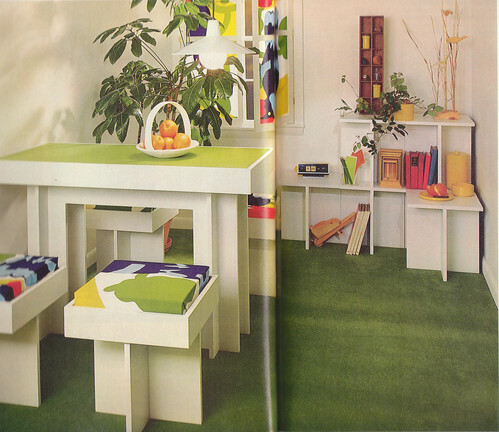 The 70s were also the heyday of the houseplant - believe it or not, A LOT of people talked to their plants back then. There was a whole movement, in fact, of plant talkers.... but, that's for another post. My children have never used a typewriter, and probably never will (unless they visit some hands on museum). I wrote a lot back then, and I sorta miss the ol' typewriter. It was loud, it didn't have spell check, and the paper was often hard to get perfectly straight; but, back then things didn't have to be so freaking perfect. 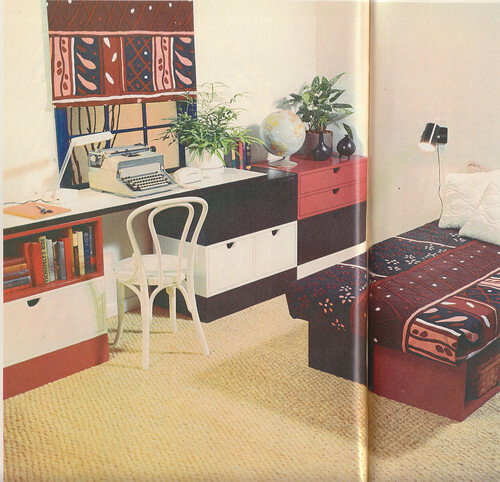 The image above is from a book on quick home projects. What an unattractive eyeful this is! 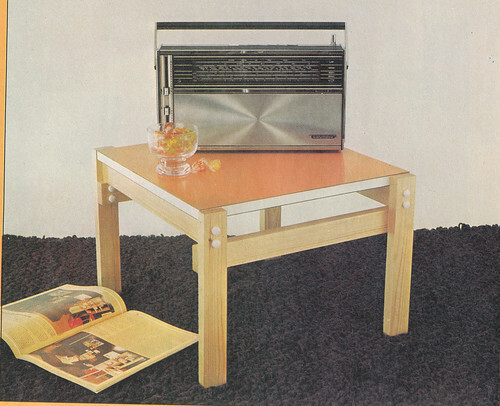 A glass of hard candy resting beside a transistor radio on a tee tiny table on battleship grey carpet.... not a pleasant sight. 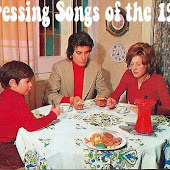 The 70s were a time of anti-tradition- out with the old, in with the new. 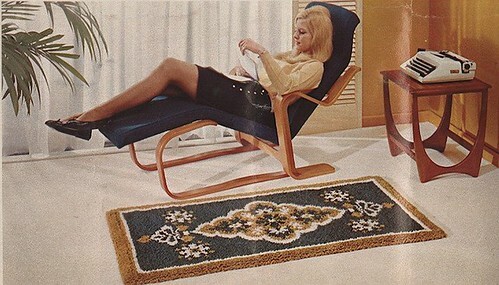 Chairs, beds, and sofas were rethought and many of the expirmental designs of the previous decades were put into practice in average everyday homes. 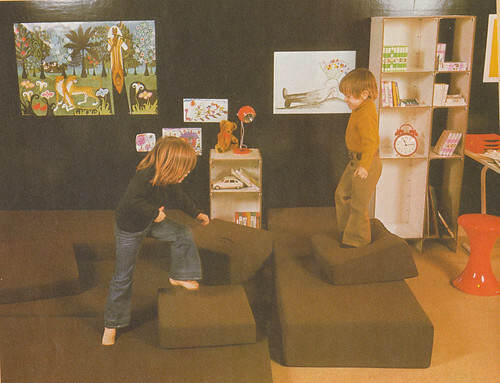 Thus, you have the Clockwork Orange chair and the modular bed/sofa. Were they comfortable, functional and practical? - no, but they were anti-traditional designs, so it didn't really matter. Yes! This is what I like. 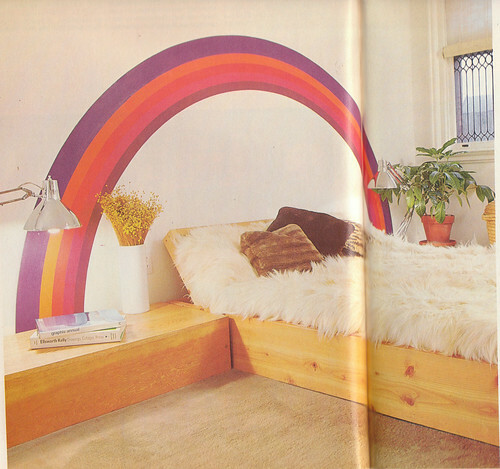 The image above is everything I want in a living room. When the kids move out, that's how I want to make my own house. It'll never happen, but it's a nice dream. Love those TVs too. I found these last four images on ebay. Check out that home entertainment center. 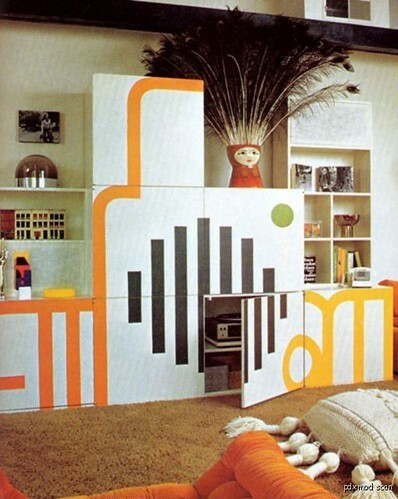 Looks like this lucky fellow has a projection screen, hi-fi record player and a betamax. Livin' large. The three firearms on the wall are a nice touch don't you think? 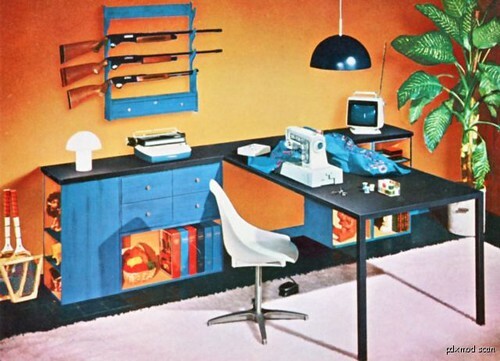 In this little room, you can watch TV, sew, type, and blow away any intruders. I like it. Talking to plants actually does help the plants; but the real reason is a lot less metaphysical and a lot more chemical. Animals, including human beings, inhale oxygen and exhale carbon dioxide. Plants do the reverse. So when people talk to plants, the plants are taking in the carbon dioxide exhaled by the people as they talk. The guns seem a bit incongruous in that last pic. 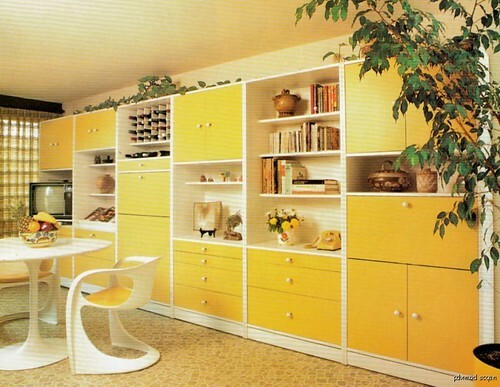 I don't have a problem with them, but they just seem so out of place in a primary color room with modernist furniture. 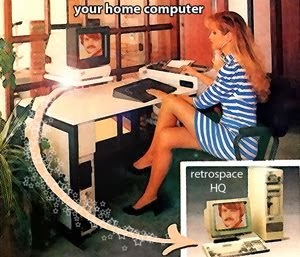 The Betamax guy also appears to have enough technology to pilot a spacecraft embedded in his built-ins. That's amazing! 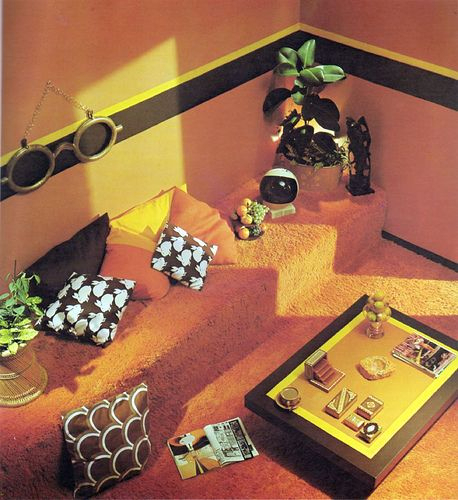 I love 70s style as well and what I like about these images is the color coordination in each room, if only it were possible to achieve that in real life! What's missing, in my view, is some of the lovely patterns of that period. I like the hanging couch swing. I don't see any Betamax VCRs in that scene, in order from bottom to top: Turntable, audio cassette recorder, early digital ratio tuner, source selector, really clunky old EQ, pre-amp, main switches to turn the whole thing on, and final amp. Trust me, I just got done checking where to update my massive knowledge of ancient video technologies and went through the entire history of the Betamax VCR all over again. Duder doesn't even have a U-matic or Cartrivision machine in that set up (the floor would probably collapse under the additional weight). 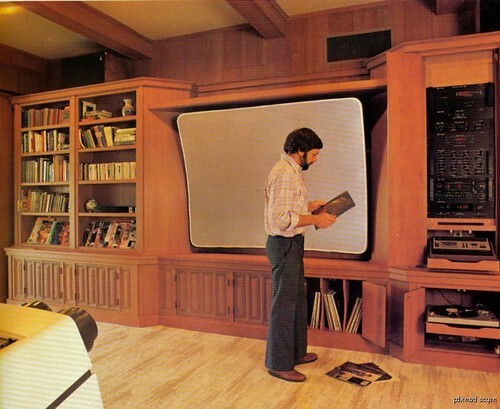 The Betamax is probably off-camera next to the giant floorbound RGB TV projection lenses. Let's Get Physical #3: Bikes! Food & Drink #9: MEAT!